Chris and his Singaporean wife Savinder Kaur founded and run the literary arts companies: Word Forward and Sunbird Arts; the literary festival Lit Up Singapore; Poetry Slam™ Singapore & Malaysia, and the Writers Centre, Singapore. Over the summer Word Forward had great success with their children’s piece, Uncle Rajah’s Flying Carpet Show, culminating with a performance at the Sun Yat Sen Memorial Hall on National Day, August 9th. I’m a traveller in time. and I speak in prose and rhyme. Chris explained that Uncle Rajah lives beside a desert oasis in a faraway land. He is head honcho of the Spellmakers’ Guild of the Universe. With his sidekick, Skid the Squirrel and seven magical sunbirds, Uncle Rajah flies through time and space keeping Skid and the sunbirds out of trouble and telling of their exploits. 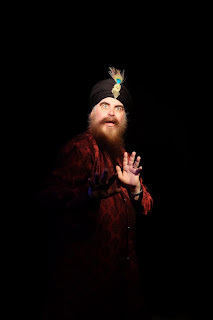 Uncle Rajah loves to tell original stories through a unique form of ‘spoken word theatre’ that presents historical, contemporary and imaginary characters to children of 3 and older. Uncle Rajah is sometimes joined by Old Stripes, the vegetarian tiger along, with early Singapore merchants known as the Rubber and Pineapple Kings. The show is interactive. Youngsters get up and learn the Funky Monkey Dance and join in the movements of Chingay Chingay Dragon, an energetic performance piece done with music. On National Day both performances of Uncle Rajah’s Flying Carpet Show were packed to capacity and everyone went away both highly-entertained and a little wiser about Singapore’s early days. Who knows where Uncle Rajah will travel to next? Perhaps he'll land his magic carpet somewhere near you?